No day is sacred and that is abundantly clear with 2018 Topps GPK Wacky Packages Valentine's Day! 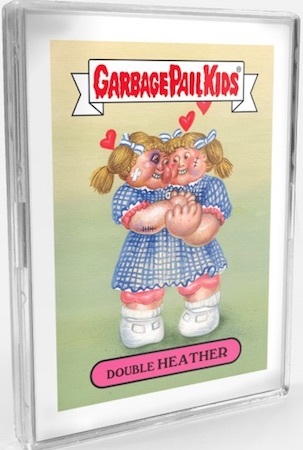 Featuring both Garbage Pail Kids and Wacky Packages designs, the nine-card set is another Topps online exclusive. While the two parody brands are usually kept separate in most other instances, it is not uncommon to see these print-to-order hybrids pair the two. However, the subsets in 2018 Topps GPK Wacky Packages Valentine's Day still maintain their distinct styles. 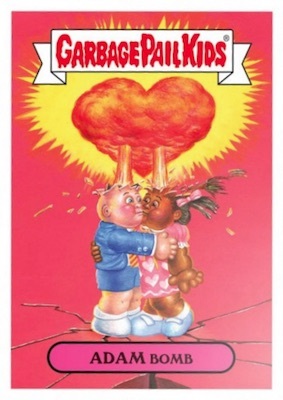 For GPK, that means those crazy kids are at it again, but using a Valentine's Day theme such as the iconic Adam Bomb locking lips with Ada as a heart-shaped explosion goes off in the background. 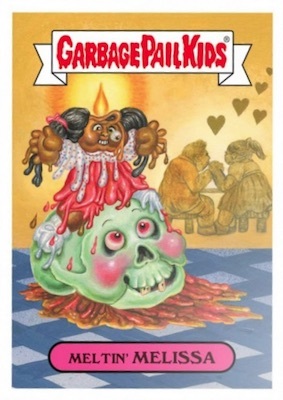 Garbage Pail Kids designs occupy the first three spots in the 2018 Topps GPK Wacky Packages Valentine's Day checklist, with two different titles for each image. 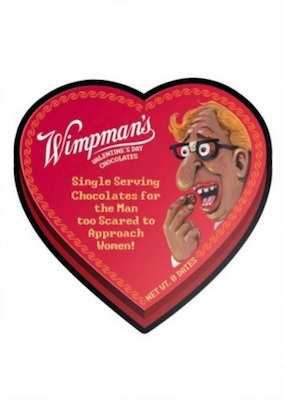 Adding to that are the three Wacky Packages offerings, including the Sweethearts-inspired Cheathearts Candies box. 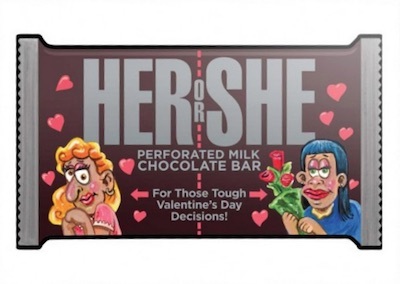 2018 Topps GPK Wacky Packages Valentine's Day is available for one week online, and only the number ordered will be printed and shipped. The full set sells for $34.99. Some of the most famous (and funny) Valentine's Day trading cards came from Topps in 1959. 6 images and 9 total cards. Shop for cards on Topps. Card titles are different for each GPK subject but the images are the same for both cards.